In recent years, the Greek state has routinely deflected domestic and international criticism of the conditions in its immigration detention centres. It has achieved this by wielding several discursive strategies, chief amongst which has been evocation of philoxenia as a natural trait common to all Greeks. Demotix/Alexandos Michailidis. All rights reserved. Immigration to Greece has attracted a great deal of attention internationally over recent years. In good part, this has been due to the fact that Greece’s extensive coastal and mainland borders with Turkey have become the main point of entry for irregular migration in the EU. Additionally, however, there has been growing debate about the ways in which migrants are treated in the country, with several domestic and especially international actors levelling heavy and sustained criticism against the Greek state for what they commonly describe as its unjust, inhumane and degrading policies and practices towards immigrant populations. Central to this debate have been the excessive use and harsh conditions of administrative detention of irregular migrants. Yet neither domestic nor international pressure have succeeded in bringing about substantive progressive change in the Greek immigration detention system. Greek state authorities have systematically neutralised criticisms by employing an array of rhetorical techniques, most notably through evocation of national heritage in the form of both direct and indirect claims that Greeks are the philoxenous people par excellence. This not a mere issue of nationalist denial; rather, the consequent maintenance of deplorable policies and practices of immigration detention has subtly served important socio-political functions inside the country’s borders. Once one begins to grasp these functions, one has already gone a long way towards explaining why the Greek state stubbornly persists in making use of rhetoric that is blatantly indefensible and bound to attract further disapprobation. Since the 1990s, Greece’s large informal labour market (including agriculture, the construction industry and domestic services) has readily absorbed unskilled and semi-skilled workers without papers. Opportunities for long-term settlement, however, are few and far between in the country, and this is due in large part to state reluctance to recognise the status and address the needs of asylum seekers and irregular migrants. Immigrants’ prospects for integration in Greek society are actively undermined, moreover, by the treatment they receive by the police. Immigrant communities in Greece are systematically subject to over-policing, including a greater likelihood of being stopped and searched and so-called ‘sweep’ or ‘cleaning operations’ launched in the name of fighting illegal immigration, drug-related criminality and prostitution. Practices of police violence against immigrants have also been reported with notable regularity, from the unwarranted use of force and the deliberate destruction of residence permits during routine identity checks, to physical maltreatment in police stations. More generally, racist violence has been a serious and rapidly growing issue in the country. Against this background, it comes as no surprise that the number of immigrants who wish to leave Greece has reportedly been on the rise (although this has also been due to the contraction of employment opportunities in key sectors of the informal labour market, such as the construction industry, amidst conditions of financial crisis since 2009). An accumulating throng of reports from domestic and especially international media and organisations have strongly condemned Greece for the unjust and harsh treatment immigrants receive in the country, as well as for the continuing failure of the Greek state to tackle the issue. This criticism, described by segments of the Greek press as ‘international ridicule’ and ‘repeated slaps’, has not yet brought about substantial remedial action on the part of the Greek state and its authorities, who have rather chosen to employ various rhetorical defences: from rationalising the type of treatment immigrants experience in Greece by emphasising the criminal and other dangers their presence allegedly creates, to explaining away failure to address the problem by reference to the exceptionally large number of irregular migrants in Greece and a lack of financial resources, especially since the onset of the financial crisis in the country, to undermining the extent of the problem or even denying the very possibility that racism can manifest itself amongst Greek people. As the Greek prime minister himself put the latter point in a highly publicised speech he gave in March 2013, Greeks have been against racism ‘from the depths of centuries’, because they are both culturally and biologically predisposed to oppose it; because ‘their tradition does not allow them [to do otherwise]’ and because ‘there are very powerful antibodies in our DNA, in our gene, which fight that “virus”’. In light of such discourse, it is little wonder that harsh state policies towards immigrants have not only continued unabated, but have also intensified and expanded in recent months and years. In 2012, for instance, a barbed-wire fence was constructed along a section (12.5 kilometres) of Greece’s mainland borders with Turkey in the prefecture of Evros in a bid to prevent irregular immigration. Similar developments have taken place inside Greece, although often under the familiar banner of Greek philoxenia. Most notably, an unprecedentedly massive police operation to capture irregular migrants was launched around the country in 2012, during which several thousands of suspects were temporarily detained, and many of them, including tourists, were also allegedly subjected to physical abuse by officers. The operation was named after the Ancient Greek god of hospitality, ‘Xenios Zeus’, and has been portrayed by the Minister of Public Order and Citizen Protection Nikos Dendias as an effort to restore the human rights of illegal immigrants, if also, ironically, as part of a broader strategy of deterrence, aimed to turn Greece into an ‘unfriendly destination’ for those considering entering or staying in the country clandestinely. The most controversial developments, however, have occurred on the front of immigration detention. The administrative detention infrastructure in Greece includes two main types of facilities: first, police and border guard stations, which are meant to be used for the purposes of short-term detention and screening of apprehended irregular migrants; and second, detention centres, which are controversially referred to in official discourse as ‘philoxenia centres’ and are for holding foreign nationals awaiting deportation. Due largely to reasons of overcrowding, these distinctions are hardly observed in practice, in that police and border guard stations are commonly used to detain migrants for extended periods of time. There are currently six detention centres, their combined operational capacity being officially around 5,000, with plans seemingly under way to add new centres and construct extra accommodation at existing sites so as to quadruple the system’s overall capacity. A wealth of reports by domestic and international mass media and organisations have demonstrated that immigration detention in the country entails lengthy exposure to conditions that amount to inhuman and degrading treatment. Overcrowding, for example, is so high that detainees often have to share beds and sleep in shifts, or otherwise simply use the floor, lying at best on mattresses or sleeping bags provided by NGOs and at worst on cardboards and blankets. At their most extreme, overcrowded conditions render sleeping possible only in a sitting position, or force detainees to lie down next to garbage and in the sewage of toilets. Other commonly reported problems include lack of ventilation, limited sanitation, extreme room temperatures, and poor hygiene. As concerns hygiene in particular, access to functioning latrines has frequently been found to be severely limited, with dozens or even hundreds of detainees having to share a single toilet that may also offer no privacy. When there are no latrines in operation, detainees are driven to urinate in bottles or through the bars outside their cells, and are escorted by guards to nearby fields where they can defecate. Serious problems have additionally come to light with regard to access to functioning showers and hot water, whilst provision of basic material necessities, from clothing, toilet paper, soap and shampoo to toothbrushes, toothpaste and towels, is typically grossly deficient. Finally, there have been reports of dysfunctional sewage systems, as a result of which urine and faecal matter spread out over the cell floor, their smell combining with body and garbage odours to create a suffocating and deeply unhealthy atmosphere for detainees. Medical provision, meanwhile, is minimal due to a lack of specialist staff, medication, and proper facilities, despite the fact that the majority of immigrant detainees in Greece are known to be suffering from such health problems as respiratory tract infections, diarrhoea, skin diseases or depression, which are linked to the long duration of their detainment under deplorable conditions. The plight of immigrant detainees is exacerbated by the violent treatment to which members of detention staff may reportedly frequently subject them. Such violence can range from racist verbal abuse, to destruction of detainees’ religious symbols, to aggressive body searches and direct physical assaults. Indeed, assaults by guards are known to have caused serious injuries, at times so serious that victims were in need of hospitalisation. In the absence of a credible complaints procedure and a well-resourced and independent inspectorate, staff violence appears to be treated with impunity (hence it has even taken place in front of witnesses such as NGO workers). There have also been allegations of sexual harassment of detainees by guards, and revelations of severe ill treatment amounting to torture, including cases that have gone unpunished by domestic authorities. 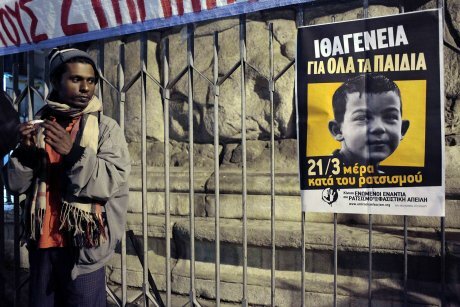 A number of domestic actors, from humanitarian NGOs to political parties and media outlets on the left of the political spectrum, have expressed urgent concerns about the excessive use and deplorable conditions of immigration detention in Greece, contesting the state discourse of philoxenia with alternative designations such as ‘concentration camps’ and ‘Greek Guantanamo’. On the international level, too, Greece has regularly been subject to harsh criticism, not just by inspectorate bodies, NGOs and other activist groups, but also politicians from various political parties, some of whom have themselves participated in inspection visits to Greek immigration detention centres. In an accumulating number of cases, meanwhile, the European Court of Human Rights has ordered Greece to pay damages to irregular migrants who have been held in administrative detention in the country under inhumane and degrading conditions, in contravention of international human rights treaties of which Greece is a signatory. Neither domestic and international criticism nor judicial intervention at the European level have so far succeeded in bringing about fundamental changes in the use and conditions of administrative detention in the country. A number of reports have come to light over the years, including notably an ‘exceptional’ public statement by the European Committee for the Prevention of Torture and Inhuman or Degrading Treatment or Punishment (CPT) in March 2011, emphasising the continuing failure of the Greek state to follow pertinent recommendations and improve the situation. As recently as January 2013, Vladimir Tochilovsky, member of the United Nations Working Group on Arbitrary Detention that had just concluded a fact-finding mission in Greece, told a press conference that the Greek state had made some progress in terms of legislative provisions. But then, Tochilovsky swiftly added, ‘you take off your 3D glasses and find yourself in a different world’, where any positive legislative amendments are practically ignored, administrative detention conditions may be worse than those found in conventional prisons, and human rights violations continue unabated. Overall, the Greek state has reacted to domestic and international pressures by employing an array of rhetorical defence mechanisms, some of which substantively contradict one another. In their official responses to CPT reports, Greek state authorities have essentially denied critical findings by stating, for example, that immigrant detainees are given unrestricted access to functioning toilets and showers; that they are regularly provided with hygiene products (although acknowledging contributions by NGOs in this regard); and that they do have available to them medical services (if again in part through NGOs). Another denial technique has been to twist negative assessment into approval. In late 2012, Greece submitted an official report to the Secretariat of the Committee of Ministers of the Council of Europe regarding the ‘living conditions of illegal migrants [o]n the border of Evros and in Athens’, where it was stated that the detention centre in Amygdaleza had recently been found by the UN High Commission for Refugees (UNHCR) to be ‘exemplary as regards accommodation and security’. Yet as the International Commission of Jurists and the European Council on Refugees and Exiles stressed in a subsequent joint report of their own, ‘in reality, the UNHCR has expressed reservations regarding the centre. UNHCR’s only positive assessment of the centre was that it was in better condition than others in Greece, a comparative estimate that does not qualify as “exemplary”’. Greek state authorities have additionally tried to absolve themselves of responsibility for recurrent or remaining problems by pointing to the excessively high numbers of detainees and the high ratio of detainees to staff, which allegedly render the situation inside detention centres particularly difficult to manage; by blaming poor detention conditions on detainees themselves and the damage caused to facilities by their protest activities; and by evoking funding constraints, particularly since the financial crisis hit Greece in 2009. Yet Greece’s failure to improve conditions of immigration detention has been due more to the way in which available funding is administered by the state than to limited financial resources per se. Greece has had access to substantial EU funding for immigration and asylum management, at least some of which could have been used to ease pressures on immigration detention centres (e.g., through supporting NGOs that operate shelters for asylum seekers). The Greek state has nevertheless long made strikingly limited use of such funding possibilities, not to mention that it has typically also failed to explore cost-effective alternatives (e.g. using empty hospitals to house vulnerable irregular migrants). In 2012, EU funding was made available specifically for supporting infrastructure projects and running costs relating to detention centres, so as to help member-states ‘improve the reception conditions in detention facilities’. In utilising these funds however, Greek authorities appear to have given priority to the expansion, through construction work, of the number of centres around the country, which would not in itself suffice to guarantee better conditions of detention. The Greek state’s commitment to improving conditions of immigration detention has been further called into question by official rhetoric that justifies them. More specifically, Greek state authorities have portrayed administrative detention pending deportation as part of a wider strategy of deterrence that seeks to make Greece an ‘unfriendly destination’ for those considering entering or staying in the country without papers. A deterrent potential has also been attributed to the specific conditions under which irregular migrants are held in Greece. At the same time as declaring that conditions in Greek immigration detention centres meet European standards, Minister Dendias has explained that these conditions stand at the ‘lowest acceptable civilised minimum’ in order to discourage illegal immigration by sending a message that the country is ‘unfriendly’ to it. Indeed, Dendias has suggested, the deterrent effect of administrative detention as such is inversely proportional to the particular quality of detention conditions. What Lies Behind the Veil of Philoxenia? The country, the society, reserves to itself the right to host those whom it wishes itself to host. This is the semiology of the name [‘Xenios Zeus’]. We do not have the obligation to host whomever judges that they wish to cross the borders clandestinely. […] We are an organised society, we want to show everyone that we are not a fenceless vineyard, that not everyone who crosses our borders has the right to stay here; it’s not like that, it can no longer be like that. Ironically, although the conditions under which irregular migrants find themselves in Greece, be it in society at large or inside detention centres, are anything but philoxenous in the conventional sense of the word, the Greek state has practically shown much less determination to reduce the number of irregular migrants in the country than Minister Dendias’ statement suggests. In fact, the Greek state appears to have played a key role in the maintenance of what it portrays as the excessive size of the irregular migrant population in the country. The long barbed-wire fence in the region of Evros, for example, was constructed with a delay inversely proportional to the urgency ascribed to it in dominant political discourse as a means of preventing irregular immigration into Greece from her mainland borders with Turkey. Stringent policies and infamously protracted bureaucratic procedures, meanwhile, have long limited the chances of regularisation for those entering Greece, as attested by the stubbornly low rates of refugee recognition and the vast numbers of migrants facing difficulties in acquiring or renewing stay permits for work purposes. The case of policing is not dissimilar: whilst no substantial changes appear to have occurred in recent years in the size of the irregular migrant population resident in Greece, the annual volume of apprehensions of irregular migrants in the country nearly halved between 2008 and 2012. To top it all off, the legal maximum duration of immigration detention has undergone repeated extensions since 2009, at the same time that a significant overall downward trend has been recorded in the volume of deportations actually carried out. Given, on one hand, that Greece has been subject to international criticism for its continuing failure to curb irregular migration and its inefficient asylum system, and, on the other hand, that irregular migrants themselves have reportedly grown increasingly willing to leave Greece, it is a paradox of no small proportion that the Greek state has largely subverted or otherwise thwarted its very own proclamations about the need to constrain the number of irregular migrants in the country. In the last analysis, the reproduction of power imbalances that is achieved in Greece through policies and practices disguised behind the veil of philoxenia needs to be understood primarily as a process of deliberate if qualified inclusion, rather than a question of designed but often failed exclusion. Since the late 1980s, for instance, the irregular or precarious legal status of large swathes of migrants, their poverty, and the limited social rights meted out to them have combined with the looming prospect of imprisonment, and increasingly of administrative detention, to render them exploitable in the Greek labour market. Indeed, the fact that standards of living inside prisons and immigration detention centres in Greece have been kept so low has functioned to threaten the most marginalised fractions of the population into accepting any available condition of work in the free community, in accordance with what has come to be known in pertinent Anglophone literature as the ‘less eligibility’ principle, arguably much more so than to deter irregular migration into the country. More recently, and especially since the financial crisis hit Greece in 2009, the widely publicised intensification in the use of penal and particularly administrative detention against migrants has been deployed by governing parties as a convenient cathartic remedy for a range of discontents amongst the Greek public, from heightened socio-economic anxieties, to increased anger with political elites, to a spreading sense of national humiliation before foreign audiences. In this case, the notoriously harsh conditions of conventional imprisonment and immigration detention may be said to have helped alleviate the pains of downward mobility and falling living standards for the average Greek citizen, providing him or her with reassurance that they continue to enjoy material advantages over those on the margins of society (and over some foreign population at that). The point here is not so much that immigrants are detained under conditions that remain inferior to those found in free society, as the principle of ‘less eligibility’ stipulates, but rather that free society itself tends to interpret the substandard conditions of imprisonment and immigration detention in terms of personal and in-group superiority–as a form of ‘more eligibility’. Note: For further analysis, see: Cheliotis, L. K. (2013, forthcoming) 'Behind the Veil of Philoxenia: The Politics of Immigration Detention in Greece', European Journal of Criminology 10(6).